Roughly 375 million years ago, proto-amphibians crawled out of the sea to start living on land. While those ancient trailblazers get the attention, their achievement wouldn't matter much without the reptiles who explored inland - and now we've found them. Paleontologists discovered 318 million-year-old reptilian footprints on the sea cliffs in the Bay of Fundy, which is in the Canadian province of New Brunswick. Although the prints are now right on the water, that wasn't the case 318 million years ago, when that location would have been hundred of miles from the nearest coastline. These footprints are easily the oldest proof of vertebrates found far, far away from the ocean. The footprints date from the Carboniferous Period when a single supercontinent (Pangaea) dominated the world. At first life was restricted to coastal swamps where lush rainforest existed, full of giant ferns and dragonflies. 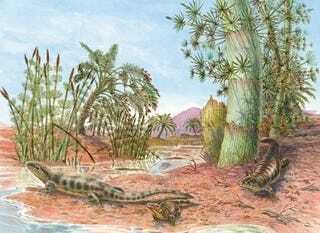 However, when reptiles came on the scene they pushed back the frontiers, conquering the dry continental interiors. A photo of the fossilized footprints are below. Click the image for a closer look.